I spent a couple of hours over the weekend logging in to each boy's blog to make sure they they could and to get the URL of their blog. That all worked apart well from one boy for whom I was given the wrong log in details. Some of the boys had not written on the blogs at all, or didn't have one so I quickly made one. I need to become aware of the school policy on commenting on the blogs- many of them could only be commented on by logged in Google users which IMHO opinion is a bad thing as it puts a barrier in front of parent or child commenting. I am a little old school though and like comment moderation on. For me, if this feature isn't applied then I need to get notification of comments in an email so I am aware of the traffic on the blogs and can quickly sort it if there is a problem. I then listed them on the main class blog so the boys could access them easily. Fortunately really some of the boys in each group were absent cos they were at swimming so I only had a small group. Everyone got a short sentence or two on their blog and a photo so that was all good. To get to the blogs we used the Safarai web interface on the iPads and that seemed to work OK. One later in the day used the Blogger app which I actually prefer but hadn't asked specifically to have them on the iPads so didn't realise was there. 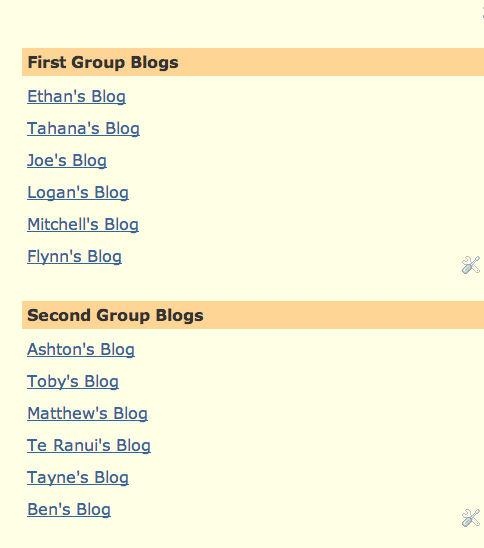 When I got home I went through each of the boy's blogs to make sure that each one had an encouraging comment. I am looking forward to more of the boys getting into it and exploring the depth and richness of collaboration that blogging can allow. I wonder if we can get a hold of some of the Chromebooks and use those as well to allow a choice of devices. I wonder also if I should bring along my own multi-box and extension cord for all the dead flat iPads that come to me on a Monday morning!